After a long time, the best Amiga audio player appeared again with a new version in August 2003. Special thank to Stéphane Tavenard for making this nice product and then for giving us the sources in order to improve his work. The development started in spring 2003 with the main aim to make a MorphOs native version and to add OggVorbis support, since this file format is more and more used nowadays. 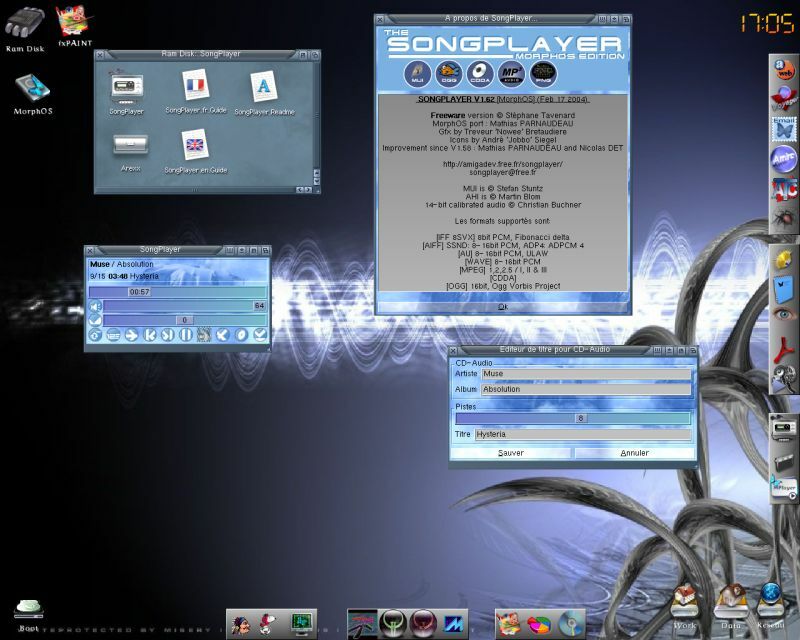 SongPlayer try to use the best of the hardware and the system components (MUI, AHI, asyncio, datatypes, ...). For example the AmigaOS version uses assembly and the audio chipset called Paula. On the other side, the MorphOS version adds graphical improvements (24-bit icons and images) and uses the SystemV ABI for the vorbisfile.library. Stéphane TAVENARD is the SongPlayer author, but he doesn't support the product anymore. Support and improvements are now done by Mathias PARNAUDEAU and Nicolas DET. If you want to give us a comment, a suggestion or make a bug report, please write to the address given in the doc (we want to avoid spam).